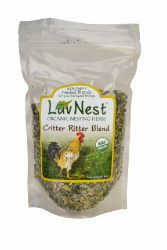 Along with the health benefits of Luv Nest Original Blend, Critter Ritter includes Rosemary, Thyme, and other herbs to help increase the effectiveness in combatting lice, moths, and other pests. All Luv Nest products are created to be added directly to the nesting or coop bedding (typically straw, hay, or shavings). 100% USDA certified organic herbs, preservative and additive free. Sprinkle 2-3 Tbsps. into Nesting Boxes; a handful into livestock bedding and coop areas. Refresh every few days.